Brimming with natural and rural beauties is El Hierro, the smallest island in the Canaries. It is also the case with its charming hamlet of Los Llanillos in the municipality of La Frontera. A true testament that size is not everything. Experience unforgettable rural living in which overindulging in nature’s creations is the norm. Take a break from the hassles of daily life. Embark on a journey to disconnect, recharge, and return from vacation renewed. Everyone deserves it. On an average day, there are things that people may not want to see, hear, or feel. Sometimes, it’s as though shutting down, shutting up, or shutting out are the only options left. Anyone who feels this way has to be reaching the tipping point. So, it’s time to take a breather. Los Llanillos is not only for the tired and the weary, though. It is also for nature lovers, walkers, and daydreamers. Bask in an authentic Canarian countryside atmosphere. There are no hordes of tourists or loud party music to tune out. Instead, there is only solitude and bliss. Sprawled in a small tract of El Golfo valley, there’s not a lot of happenings or growth in tourism. Ironically, that is also the reason why people visit. Instead of palatial hotels, there is the imposing breathtaking view of the mountains and the cool breeze from the vast Atlantic. The tranquility and magnificence of the scenery are beyond words. It leaves visitors with no other option but to embrace the experience of the sights and sounds of nature in all its grandeur. Rural vacationing and unwinding begins upon arriving. Nicely kept traditional Canarian abodes with vibrant gardens are a feast for the eyes. Walk around the village but even better, visit the orchards on its fringes. Five minutes away by car, the magnificent Charco Azul faithfully waits for visitors to take a plunge into its natural turquoise pools. The idyllic town, overflowing with an abundance of natural wonders, is also home to warm and friendly locals. Stop everything else and appreciate it for what it is. Look at all the fantastic sights and cherish them as there’s very few like it left. Lastly, listen. Listen at the sound of tranquility, of birds chirping, and the whistles of the wind. Most tourists prefer car hires to go around the island freely. Public transport is also available. Although convenient, it is not as extensive as the other islands. Unlike in Tenerife and Gran Canaria, the bus trips within El Hierro aren’t as frequent. From the capital Valverde, take bus line 3 to Frontera. During regular working days, it leaves at 08:00, 10:30, 13:10, 15:30, 18:00, and 21:30. On weekends and holidays at 08:00, 10:30, 13:30, 18:30, and 21:30. From the Frontera station, take any of the bus line 4 trips to Los Llanillos. Some of these buses go through every town in the municipality while others head to Sabinosa and Pozo de la Salud. Note that there are no trips during Sundays and holidays. Fortunately, there are no hotels in this hamlet. Instead, there are lovely traditional houses turned into holiday rentals. And, it is the closest one can get to authentic Canarian rural living. CasArte is a sanctuary for artists and free thinkers, but it is also open to regular vacationers. It may seem like a typical stone house with fabulous garden, but, indoors, it resembles an art gallery. For those who want attractions even inside their rental, it can’t get any better than this. Anyone who would like to stay here, though, should book as soon as possible. They offer residency programs, so there are months when it’s hard to reserve. Casa Rural Los Llanillos is a traditional Canarian dwelling that radiates charm. It has an outdoor sitting area with vistas of the village, the orchards, and the vast Atlantic. The interior, with its lovely wooden ceilings and framed windows and doors, is just as beautiful. Unlike other rentals, it has a unique underground bedroom with a patio. So, guests can enjoy the sights before or after resting on the super king and twin-size beds. They can also relax in the living room and watch movies using the satellite TV. This casa is a cozy home away from home. For a contemporary Canarian country house, the one-bedroom La Bodega is ready to serve. It is a red 2-floor abode with complete amenities to make their guests’ stay comfortable and fun. Feel free to whip up tasty home cooking in their fully-equipped kitchen. A barbecue and beer weekend on the terrace with a sea and mountain views is also excellent. This picturesque small town’s sole restaurant is the Tienda-Bar Los Llanillos. Also, the owner likes to keep everything uncomplicated from the name of the place, which is Spanish for ‘store-bar of Los Llanillos,’ down to the food offered. Diners can sample delicious plates of arepas de carne mechada with ham and white cheese, sandwiches with roasted meat and white cheese, French omelet, papas locas, and hamburgers. Since it’s also a store, tourists can buy other staple products here. A holiday away from the daily bustle is needed to breathe new life into the old worn self. 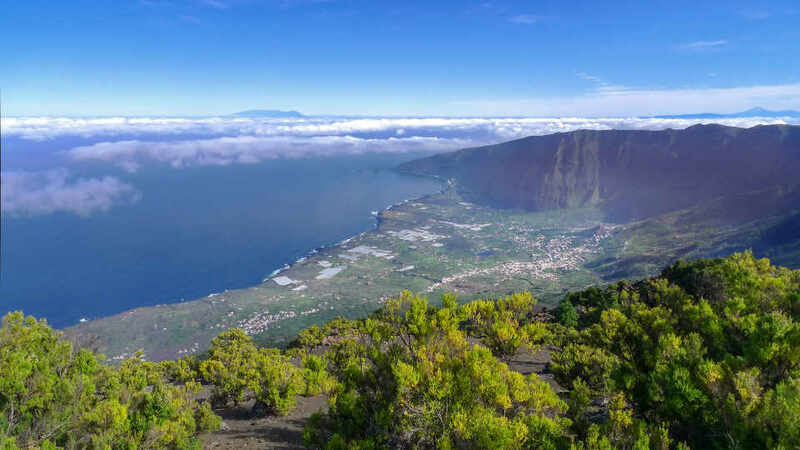 Why not travel to El Hierro’s entry on the best place for unwinding category? Wander in Los Llanillos’ landscape of mountains, groves, and houses with colorful gardens. Dine in its lone bar and chat with the locals, learn about the everyday life in a rural paradise. Gaze at the sparkling Atlantic and wonder about the secrets of its peacefulness. Enjoy a cup of coffee on the sun terrace of a century-old stone house. While at it, marvel at the natural magnificence of this part of El Hierro too. In this hamlet, disconnecting and going back to basics come easy.